They are tough and slow growing - will last for many years, and require almost no maintenance. Supplied as a 5 year old plant in a 3L pot c 30cm tall. A stunning and striking architectural plant that suits modern garden designs, or desert and cactus styles, especially in a metallic pot. 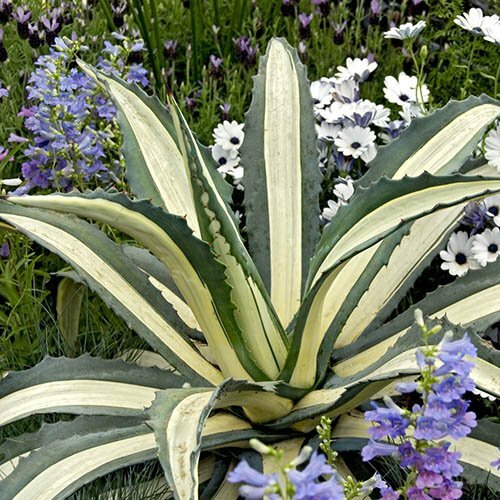 This unusual form has a bright white stripe down the centre of each leaf. This tough succulent really thrives in neglect, and is surprisingly hardy in the UK - we have had them for 5+ years outdoors all year, and are fine if you keep them very dry. It is a striking speciment, very slow growing over here, but long lasting. After 20 -30 years they may flower - unleashing huge 3-5M tall flower spikes in a last act of bravado, as after flowering they die. However, there are normally lots of 'pups' round the side by then,. which imemdiately take it's place. Warning - the leaves have very spiky tips, and some smaller ones on leaf margins. Handle with care. Avoid places where chidlren or pets may brush against them. Supplied as a 5 year old plant ina 3.5L pot, 30-40cm tall. Beware of spines on leaf tips.